StarStreet has introduced a game for daily fantasy sports fans that also like playing the stock market and turned it into a fantasy game for players to make money by combining the love of both. The main idea behind StarStreet is a sports stock market where owners can buy stocks, not of different companies, but of individual fantasy sports players. When playing on StarStreet, the value of your player’s stock is determined by how well that particular fantasy player is performing on the field compared to all of the available fantasy players. You can buy and sell shares of your fantasy player’s stock just like a real stock market. 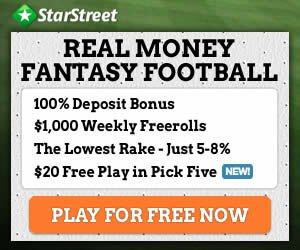 StarStreet is actually 3 fantasy sites in one...because in addition to their unique and interesting fantasy stock market game, they also have typical daily fantasy sports draft games and a Pick 5 game. This StarStreet review will summarize all three games for you. For fantasy players looking for new games to play, StarStreet has a niche market for you to check out and see if your real life stock market knowledge combined with sports knowledge can translate into real money. The layout for StartStreet is pretty simple, but for those that enjoy the chat forums of other daily fantasy sports sites, you will be disappointed. At the top of the screen, you can chose the type of game you wish to play which takes you to that game’s menu board with a simple layout for players, games available and entry fees. The site keeps a running total of you win/loss record for others to see and even shows how much a player has earned playing games at StarStreet. You can view their recent stock market player trades and enter your own avatar as well. We found the site a big laggy switching from game to game, but nothing that should deter the average player from joining StarStreet to play. They have up to the minute stats kept for players when you are following your games online where as some sites are fairly slow to update - good job StarStreet! Making a deposit at StartStreet is really simple and you can use a major credit card or your PayPal account and StartStreet also covers all the card and PayPal fees - another thumbs up! Stock Market – The main game at StartStreet is a real money stock market game based entirely around sports where you trade shares using sports athletes as stocks. A player's share price is based on their fantasy performance compared to other players’ fantasy performances in the market. Each fantasy player has 200 shares of stock available and you can buy or sell your player's stock based on prices set in the market by other owners. The strategy in playing this fantasy stock market is to know when to buy players and when to sell to improve your market position. There are traders that actively trade everyday based on the performance of certain players and some that trade weekly. There are IPOs for new players that get announced and in general there are usually 55 players at a value of 200 shares each to actively trade. Daily Fantasy – StarStreet daily fantasy games allow you to enter to play head to head, in a 6 man league or mulit-player league. You can try it for free or play for real money starting as low as $1.08 up to $525. For MLB Baseball, you are given $100,000 to spend and you need to choose a minimum of 3 players. Here is the kicker - you can choose the same player up to 10 times to fill in your roster. For example, let’s say you have a feeling that a 1st baseman usually valued at $8000 is going to have a monster game, you can pick him 10 times using $80,000 of your initial salary cap, then stick in another player or two to fill your roster. This unique twist can help or hurt you as you put all your eggs into one basket. 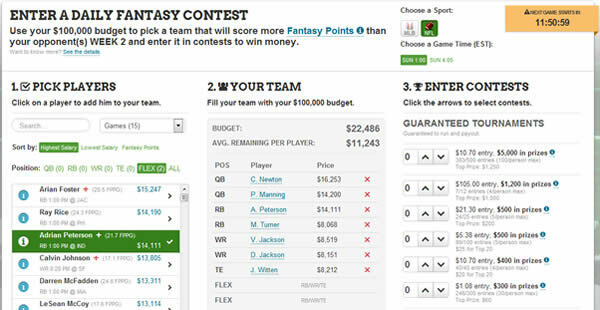 For NFL Football, it works much the same as any other daily fantasy sports site - you fill your roster using the $100,000 salary cap and must fill all positions. The main difference at StarStreet - there are no kickers or defensive teams. Seems like StarStreet always wants to be different in some way. Pick 5 - StarStreet also offers the Pick Five contest where you play against yourself with a chance to double the money you put in. The game is extremely simple - you buy-in at either $1.08, $5.23 or $10.70 trying to win $2, $10 or $20 respectively. 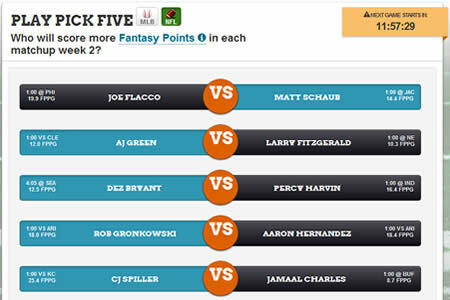 StartStreet posts 5 player matchups and you simply pick which player you think will score more fantasy points that day. If you pick 3 out of 5 correctly, you win! They even have the option to make a bonus bet in which you enter for $1 or $5 and if you get all 5 correct you win 20x your money. This game is so easy and quick that you can play it conveniently on your mobile smartphone in less than 2 minutes. Upon sign up at StarStreet you get to Enter a FREE Pick 5 Contest to try and win $20. It’s tough to review a site like StarStreet, because you want to review not only the stock market fantasy game but also do separate reviews for the daily fantasy sports games and Pick 5 game at StarStreet. The typical fantasy players looking for reviews for fantasy sites may not be initially looking for a stock market game, but StarStreet does allow for a fantasy player to expand their horizons and play the different game offerings. The games offered by StarStreet are a nice change of pace from the typical daily fantasy games that we’ve reviewed, and if you really understand the stock market, you probably can make a really good income over a full sports season. 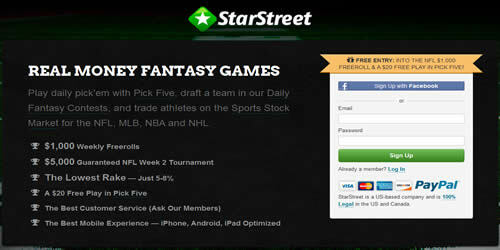 If you aren’t adept at playing the market, the fantasy stock market game could be a bit overwhelming, but the additional game of Pick Five and their unique daily fantasy game make StarStreet a good option for those looking to play a variety of styles of games. Don’t forget, by joining through our StarStreet Link, you get a deposit bonus, to either play daily fantasy or start building your stock portfolio, an entry to a freeroll daily fantasy game and also a free Pick 5 entry. Definitely worth checking it out!